I tend to wear a lot of color, which shouldn't come as a surprise to anyone who follows my blog or even someone who takes a cursory glance through my photos or Instagram account. It's pretty obvious that I'm infatuated with color, but sometimes it's nice to change things up a little bit. So, today, I am wearing more neutrals in the form of soft, blush tones. Despite the fact that this is a more toned down look in the color department, I did find some ways to add my signature pop of color here and there. Take, for example, my green belt, which is not only a somewhat vibrant color but also brings out colorful bug embellishments on my pinstripe shirt. On a side note, I kind of thought the embellishment trend (or, as I like to refer to it, the "bedazzled" trend) would be over by now, but it's definitely still going strong. This is fine by me, especially since a fairly significant portion of my wardrobe contains crazy beads, jewels, rhinestones, and other doodads! I promised to stop buying stuff like this, but, as is the case with many of my wardrobe resolutions, I tend to break them! Old habits die hard. Such a lovely ensemble! I really like this shirt! 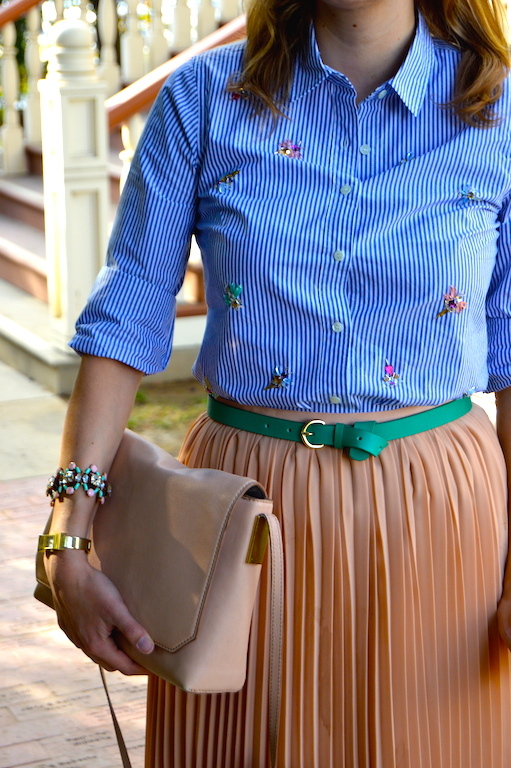 I love this more neutral outfit with the interesting pops of color - such a great belt & I love the bees on your shirt! Very nice! Enjoy the rest of your Sunday & have a great week! What a pretty look! 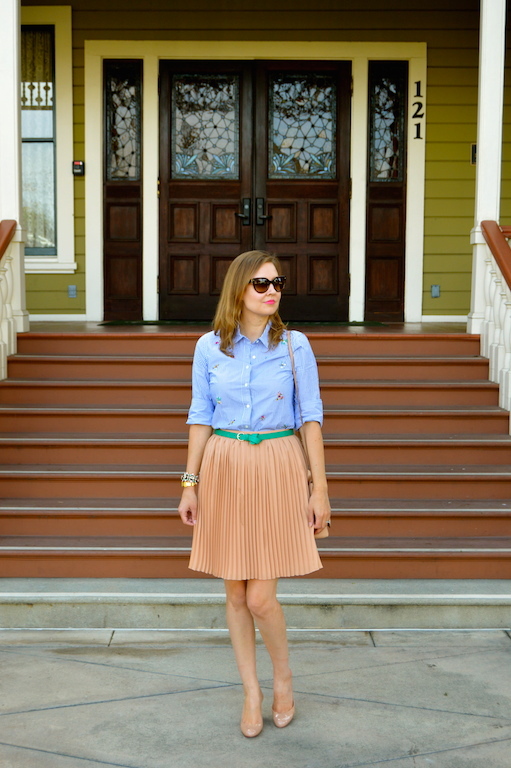 I love the color and pleats of that skirt. I also love how you made this look your own by adding the bright green belt and the pink lips--even those small pops of color make a statement! I love your neutrals with the little pops of color! That green belt is fabulous!